This week I was given my first (of many I hope…I CAN DREAM!) blogging awards. 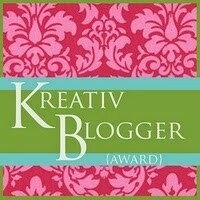 Ally over at her blog ‘Cancer and Baby Equals Chaos’ selected me for a Kreativ Blogger award. Give you 10 interesting facts about me…this is going to be hard! 1 – I don’t wear any other colour of clothing but black. 2 – I was once featured in a woman’s magazine article about living with Asbestos in our house. 3 – I used to be a promising young 10-pin bowler and even represented Leeds. I have trophies and everything! 4 – I had a strangulated hernia as a baby and had to have major surgery. 5 – Have never broken a bone in my body. 6 – Sadly lost both parents before the age of 28. 7 – Is one of the few people he knows with no tattoos or piercings at all. 8 – Grew my beard as a joke…that was about 4 years ago and it’s still here! 10 – Once took part in a fun run alongside Sir Jimmy Saville. Now to choose other bloggers to pass this award onto! Thanks again to Ally for selecting me for this award and hopefully I can live up to it…no pressure! Am I a bad parent already?